The Arna`s tunnel under the trucks is the natural space for graffiti. Here is some shots from there. This is a long post, including 13 full coloured pictures, enjoy all of this. Open gate with view on the city. This is a piece of Bergenhus. Is the high part named Sverresborg. And this a view on Sverresborg. 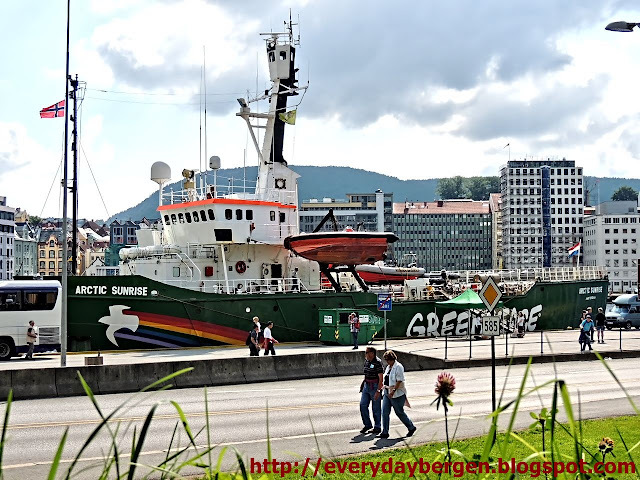 The Greenpeace ship, Arctic Sunrise in Bergen havn. Five big cruise ships in harbour, hundreds of buses from everywhere. For a small 300.000 city. A quiet cool place, for the hot days. Yestarday`s evening walk with camera. Hi All. Some joke. This is my Royal Baby. The Girl.